The Taiwanese are known for their hospitality. Whether it’s the close friendships, the warm greetings or the high levels of service in restaurants, shops and hotels, this culture knows how to look after you. Even if you’re asking for directions in Taipei, you’ll generally get a smile followed by a well-thought out answer that helps you on your way. This friendlier-than-friendly culture is played out perfectly at Check-in Tapei, Hollywood Road’s newest restaurant. 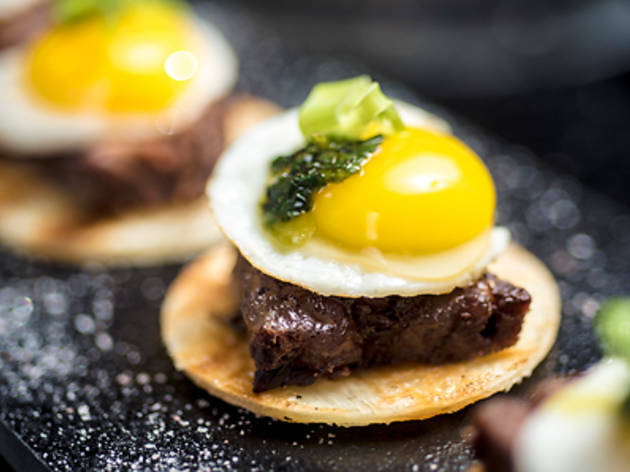 It’s a 38-seater which seeks to spin traditional Taiwanese cuisine in a more contemporary and sophisticated direction. As we enter, this ethos is inherent throughout the venue. We take in the modern and vibrant space, which, although small, is nicely offset by the black and white contrasts of the décor and furniture. And the staff are, of course, immediately super friendly too. Check-in boasts drinks architect Shin Chiu, who has represented Taiwan in international cocktail competitions. You’ve got to try some of his creations while you’re waiting for the grub. On our visit, we go for the signature winter melon pudding slush (pictured above/ $58), a concoction which sees winter melon tea combined with frozen blended pieces of the fruit and lined with a tofu base, topped off with chewy sago pearls. It’s extraordinarily refreshing, with the tofu smoothing out the grassy bite of the winter melon. Our gastronomic journey begins with an Asian green salad ($78). There are Formosan undertones of lily bulbs, black fungus, lily root chips and osmanthus jelly in among the traditional green salad leaves – and the result is a refreshing mix that tastes not only fresh but also has Taiwanese street food notes. It’s a new take on the green salad – and a welcome one at that. Next up is the chicken waffles (pictured above, $128), an old American favourite with a twist. The bird is marinated with five spices and sugar, and it sits on top of a pineapple chutney that strategically cuts the grease while enhancing the crispy waffle’s flavours. Simple yet contemporary. We also try the beef tacos (pictured above/top, $118) – miniature versions of the classic pork street food ‘gua bao’. 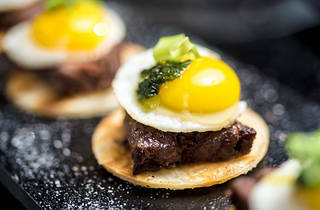 This dish swaps pig for cow and places marinated beef shank meat and caramelised leeks on green onion pancakes before popping a quail’s egg on the top. The presentation is adorable – the baos look like pintsized breakfast tacos. And they taste great too, with the beef and egg working in harmony, however it’s a shame we can’t really detect the green onion in the pancakes and the leeks aren’t really noticeable either. It’s nevertheless a satisfying dish, though. And the ‘ping pong’ ($98), a yam mochi – rice cake – with a cheese filling, is also good – but it’s perplexing too. We love the chewy yam consistency and the salty parmesan filling – but they don’t work together as a team. You’ve got to separate them out to get the benefits of this dish. Lastly, we order the CIT noodles ($168), which are actually rigatoni with pieces of braised beef in a sweet soy sauce, all covered with an organic egg which has been poached at exactly 63 degrees Celsius. The sauce is a classic Taiwanese noodle accompaniment and pairing it with rigatoni is pure genius, as the tube pasta pieces catch the rich meat and soy flavours a lot better than noodles would. All in all, we love Check-in Taipei. There’s a heart here that goes into the food and drinks, and although the dishes tend to be on the small side, the presentation, ingredients and taste all impress. There’s also a ‘fun’ element that makes you smile – and, of course, that classic Taiwanese hospitality and friendliness shines through the place. Basically, you don’t need to check into a top Taipei hotel and hit the streets for the best food the country has to offer. You just need to check into Check-in. Check-in Taipei 27 Hollywood Rd, Central, 2351 2622; facebook.com/ctaipei.